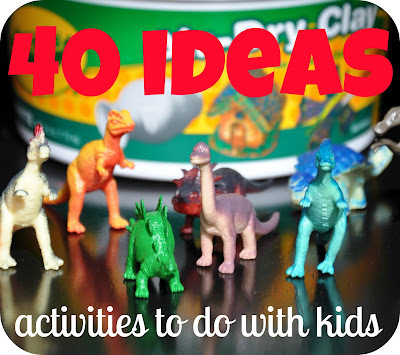 Little Bit Funky: 40 Ideas! Number 1-Dino Fossils! 40 Ideas! Number 1-Dino Fossils! Our first activity is dino fossils!! I had no idea the boys would like these so much! First we read "How the Dinosaur Got to the Museum". Then I told the boys we were going to make our OWN dino fossils! They were stoked!! All you need is an air dry clay of some sort. I used Crayola Air Dry Clay and I got it from Jo-ann. 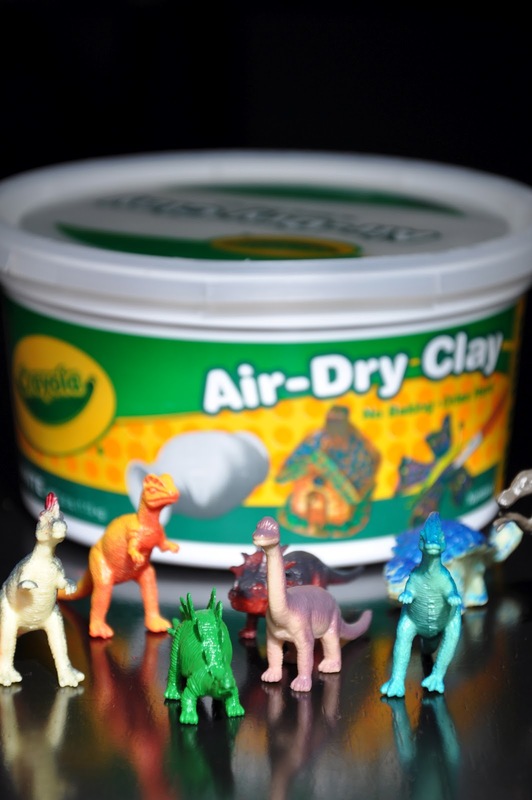 There are several varieties of kid safe clay that you could use, I just had this on hand. You also need a variety of small dinosaurs. These were in our collection and were about 2in long. 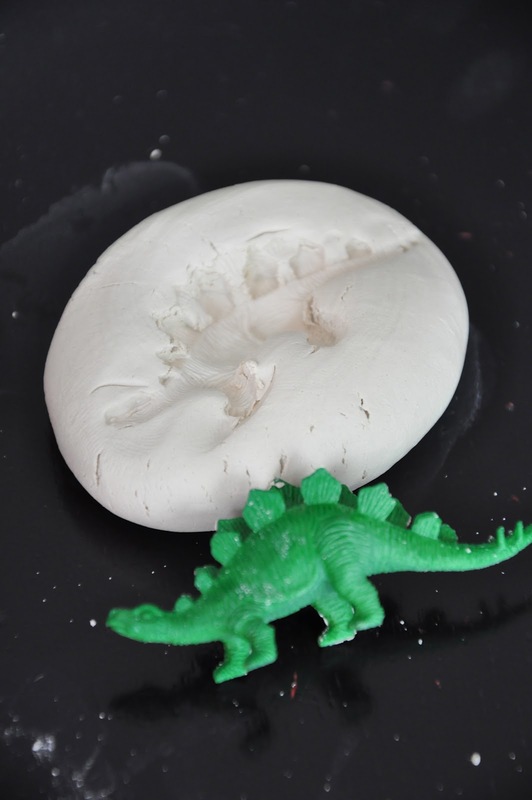 Take a chunk of clay and roll it and knead it into an egg shaped ball and flatten it. 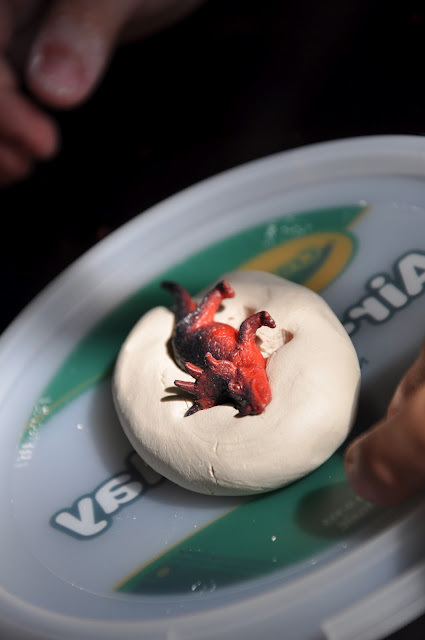 I then put the "egg" on the lid of the clay container and let Moses gently put the dino into the clay. Then pulled them out gently...by the tail worked best! And voila! You have a fossil! If your kids are old enough you can let them paint them when the clay dries. We made a bunch and the boys like to play a matching game by matching the dinos up with their fossils. Have fun! And come back soon to see all the rest of the wonderful things you can try! 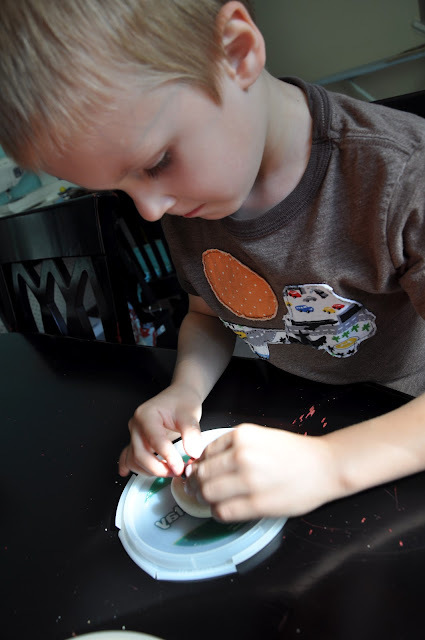 Until then you can have a "mini art lesson" or "paint with pudding" or "go crazy with shaving cream"! what a fab idea! my son will love this!! I have to remember this when my son gets older!